If you are in the market for an auto loan, you may want to check out MoneyAisle. In case you are not familiar with it, MoneyAisle is a free, fast and easy way to get a great rate on your auto loan or deposit products. The way it works is pretty close to how Lending Tree does its business, that is, having lenders compete to service your loan. According to MoneyAisle, there are over 200 banks and credit unions compete against each other in its live, on-demand auctions for your business, and you choose the best one that meets your requirements. 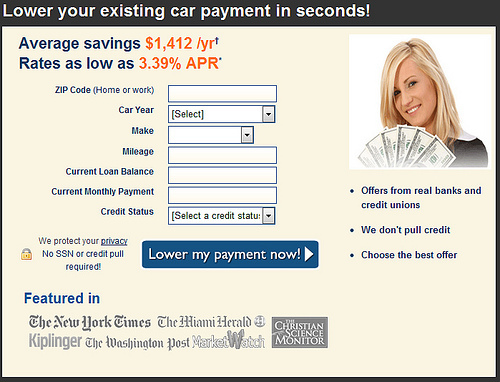 I have looked at how to use MoneyAisle to find savings accounts a while back, but didn’t try their auto loan tool. Give it a try. Maybe you can actually save some money (save up to 40% on your interest payment or up to $1,000 or more on your car loan as MoneyAisle claims). Can You Get a Better Rate at MoneyAisle? E*Trade Raise Rates on Complete Savings Account: Interest Rates Bottomed? Payday Loans as Last Resort? Auto Insurance: Should I Switch?